1. Tommy & The Tom Tom's Bonie Moronie [unissued] uniss. 2. Tommy & The Tom Tom's Baby Let's Play House [unissued] uniss. 3. Tommy & The Tom Tom's So Tough [unissued] uniss. 4. Tommy & The Tom Tom's It's Too Late [unissued] uniss. 5. Tommy & The Tom Tom's Oh, Boy! [unissued] uniss. 6. 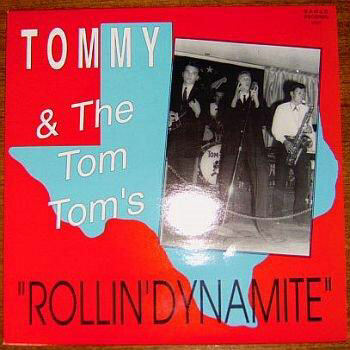 Tommy & The Tom Tom's Whole Lotta Shakin' Going On / Love Is Strange [unissued] uniss. 7. Tommy & The Tom Tom's You Can't Catch Me [unissued] uniss. 9. Tommy & The Tom Tom's Only The Lonely [unissued] uniss. 10. Tommy & The Tom Tom's Dream Lover [unissued] uniss. 13. Tommy & The Tom Tom's Almost Persuaded [unissued] uniss. 14. Tommy & The Tom Tom's Somebody Helped Me [unissued] uniss. 16. Tommy & The Tom Tom's Toy Bell (My Ding-A-Ling) [unissued] uniss. 17. Tommy & The Tom Tom's Jambalaya [unissued] uniss. 18. Tommy & The Tom Tom's Work With Me Annie [unissued] uniss.